The 2013 Dodge Dart is Available Now! The 2013 Dodge Dart is available now at Rothrock! The Dart is a fantastic piece of machinery, combining fun-to-drive aspects with cutting-edge technology, a spacious cabin, top of the line safety features, very high mpg and a revolutionary exterior design. The Dodge Dart has one of the nicest cabins in its class according to Edmunds.com, with padded surfaces, colorful trim and an available 8.4-inch touch screen. There’s also plenty of room on the inside, with lots of legroom and a large back seat. The exterior is unique in design, but borrows certain cues that have been successful with other Dodge cars in the past. The racetrack LED lighting in the back of the car is inspired by the current generation Dodge Charger, and the flying buttress was inspired by the second generation Dodge Charger. The safety features of the Dart are hard to beat, because antilock disc brakes, traction and stability control, front and rear side airbags, side curtain airbags and front knee airbags all come standard. A rearview camera, a blind-spot monitoring and a cross-traffic alert system are also available. Also, the 2013 Dart delivers incredible performance. Estimated fuel economy is 25 mpg city/36 mpg highway, and the standard 2-liter four-cylinder engine produces 160 horsepower and 148 lb-ft of torque. A turbocharged 1.4-liter four-cylinder engine is also available. 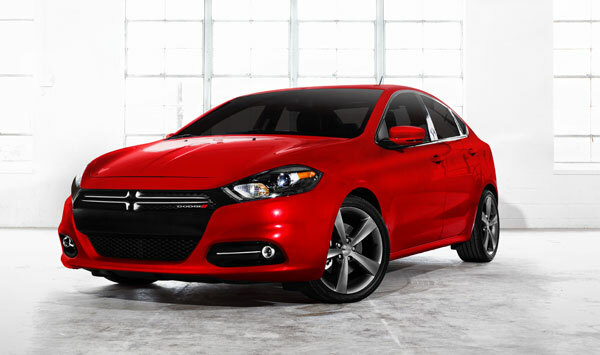 If you’re interested in the 2013 Dodge Dart, be sure to call or visit us at , and we’ll be happy to arrange a test-drive.